The white parts that make up the body contours of this guitar have been 3D printed to meet [Bård S D’s] personal specifications. He started designing the pieces last year to add to his Zoybar guitar. Each of the three parts has its own function. The tail piece serves as a floor stand, as well as a hook for hanging the instrument upside down. The wide piece at the top gives the player a place to rest the forearm, and the piece at the bottom serves as a cradle to place on your leg, and contains the jack for the guitar’s pickup. You can see him playing the instrument in the video after the break. We looked for more information on the Zoybar system but it’s a bit hard to get the facts from that website. We know that the 6-string kit comes standard without frets, and it’ll cost you a pretty penny at around $700. But if it performs as a quality instrument the price isn’t too far out of line. Would be better with a more curvy looking “stand”. it doesn’t flow with the rest of the instrument. Looks cool, but I’d like frets, a better bridge, and a place to pivot my right pinkie for soloing. Still, I had a flying-v once and that was definitely an example of form over function and I loved that guitar. The modular design makes me think about the ability to reposition the pickup on the fly, and maybe even hotswap pickups. Just a thought. Cool, I wonder what kind of plastic was used? I had the idea of printing automotive body panels from ABS plastic. It’s actually a good material for this, a lot of Lotus cars have ABS panels. Of course you’d need a huge printer, but it beats the hell out of fabricating from fiberglass, and if you damage a panel you just print a new one! It would be great for kit/custom car builders. The leg cradle, does not contain the jack. The (well I guess the body of the zoybar) contains the jack. The leg piece cradles the cable off of your leg. Keeping you from snagging it or smashing it on your leg and straining the cable and jack. 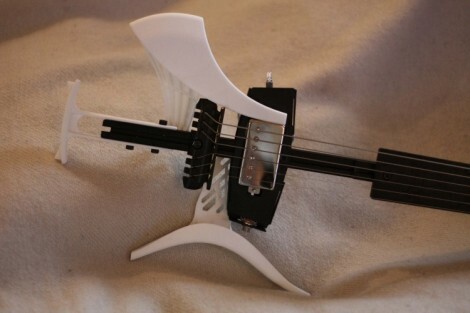 $700 for an electric guitar made of plastic? Doesn’t sound like a “quality” instrument to me. Musical peskiness aside, awesome hack!! In the grand scale of things, $700 isn’t very much for a musical instrument. This is not a guitar in the traditional sense. As they put it “open Lego kits for music instruments” This concept has the potential to bring new ideas to life without the need to reinvent the wheel every time. The fact that you can customize a collaborative hardware project is by itself an achievement. Actually, there’s little reason quality guitars can’t be made from synthetic materials… In fact, they can offer benefits such as resistance to environmental factors such as humidity and warping. I nearly bought an axe from now defunct “Switch” guitars that used a platic resin they called “vibracell”… The fretboard was created from “Ebinol”, similar to the material used for bowling balls. By all accounts these cheap guitars played and sounded much better than their low price and “plastic” construction implied. It’s also worth noting that the wood in your “average” guitar plays less of a factor than you might think… Les Paul built his original “log” from little more than a narrow pine plank… Not to mention that the current supply of FSC lumber is of overall significantly less quality than what was available years ago. well, you’ve made a fretless electric guitar which is quite rare because of usefullnes. then you decide to put a flat fingerboard (I consider it a really bad idea) so it’s good for fast notes and bad for chords. then you make it from plastic, ok that’s good!. but… because the absurd small size ob that body doesn’t mind the material you use for it, it won’t have any sustain (doesn’t mind the pickups u use un it). It will be cool to show it to your friends, but the crap sound will make you not to play it. As a trained luthier I need to point out there are so many problems with that thing than you can shake a stick at.I could care less about the material choice but there simply isn’t enough of it.Sustain requires mass since this thing has virtually zero mass the sustain(unless augmented electronically) will be horrible.A flat fingerboard…wow. It was said that the “wood in your average guitar plays less of a factor than you might think” you need to preface that with electric and then completely recant it.If you believe that two guitars made on the same equipment by the same person with the only difference is the body wood will sound the same…or even close you are smoking something I used to. Yes Les Paul made his original electric guitar out of a pine plank…but that was 1940 and he didn’t keep doing that. Innovative? yes.Interesting use of a 3d printer? yes.Quality musical instrument? I doubt it. Except the electric guitar hasn’t changed terribly much in 50+ years. This is a cool idea, using a printer, but it’s certainly not worth $700. There simply will not be any sustain. You have almost no mass, and it’s fretless on top of it. Bleh.